Our pharmacists offer compounding services to many prescriptions. Let our experienced staff provide your needs! 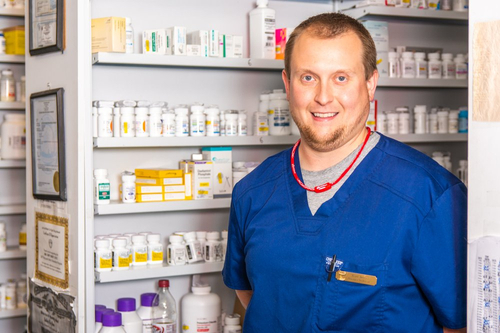 When you walk into Coliseum Park Professional Pharmacy, you’ll see shelves filled with everything from sunglasses to knee braces to over-the-counter medications. UGA is waiting at our station to sit, stay, and greet you with his sweet, bulldog grin. Let us know what you need. We’re always here to listen. We make sure you have more information when you leave than you did when you arrived. We’re a small and local pharmacy focused on what matters most, your health and wellness. Owner and Pharmacist, Robert M., graduated with his degree in pharmaceuticals from the University of Georgia in 1993. Since then, he's worked in multiple pharmacies, received awards, and learned how he can best serve his community. In 2000, he decided that would be by creating a place where people could count on a happy, consistently positive experience.